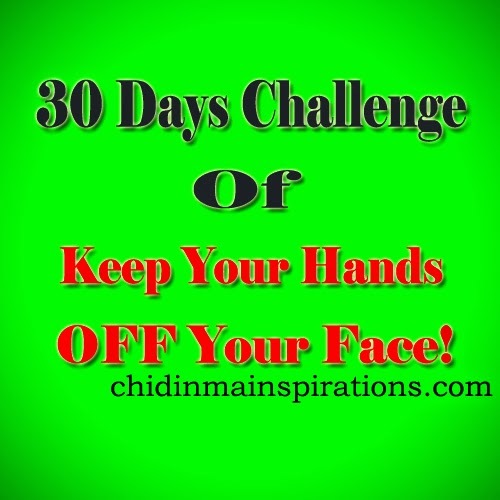 Chidinma Inspirations: Day 29 & 30 Of The 30 Days Challenge Of KEEP YOUR HANDS OFF YOUR FACE! Day 29 & 30 Of The 30 Days Challenge Of KEEP YOUR HANDS OFF YOUR FACE! WOW!!! Today is the last day of The 30 Days Challenge Of Keep Your Hands OFF Your Face! (Here >>> chidinmainspirations.com/2014/12/keep-your-hands-off-your-face.html?spref=tw … is what the challenge is all about). It has indeed been a journey. Awesome I might say. So beautiful people, how was your Day 29 & 30? How did it go? Did you touch your face? Please do share with us, what this challenge has taught you. My Day 29 & 30 went pretty well. I didn't touch my face in my Day 29 but I kind of touch my face twice today. Not a great way to end the challenge right? But not to worry, this challenge will stay with me cos it has so grown on me now. This challenge really taught me to be more disciplined. So dear people, please do pray tell on how your Day 29 & 30 went and on what this challenge has taught. P.S- I plan on us embarking on another challenge in a week time. Should we embark on it or should we rest a bit from this challenge? Finally finally,so glad the challenge has ended.its wasn't an easy one,but it all good.my day 29 and today was awesome,I didn't touch my face...this challenge has taught me to be more careful with my hands generally because of unseen germs,and am really thankful.Another challenge should be up soon,but please not this week. That's great to hear dear. I am glad you learnt something from this challenge. Ok dear, I will publish today when the next challenge will begin ok? Can't wait to start another challenge and also continue building on my previous ones. Awww...that's great to hear dear Paul. I am so glad you learnt something from this challenge. Exactly dear, whatever you set your mind to, you will definitely achieve it.